AALA Judith Perez makes her final appearance before the LA Unified school board on June 9, 2015. 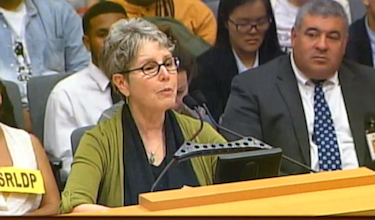 Judith Perez‘s 46 years with LA Unified came about through a random encounter in her early 20s. “I was not one of those people who knew at age five I would be a teacher,” she told LA School Report. After moving to Los Angeles in her early 20s and bouncing around a few unsatisfying jobs, she ran into, of all people, her old college roommate from the University of Texas at Langer’s Deli on Alvarado Street. Perez didn’t even know her friend was living in LA. They sat down to catch up, and it turned out her friend was a teacher at LA Unified and loved the job. Intrigued, Perez decided to enroll in the same USC credentialing program her friend had taken and before long started work as a teacher with the district. After 18 years of teaching, 22 years as an administrator and six as president of the Associated Administrators of Los Angeles, Perez will be stepping down and retiring on July 1. She will be replaced by Juan Flecha. Perez said she thought the biggest ways the district has changed are the expanded opportunities for women and the increase in collaboration between principals and teachers. “If you look at the district as a whole, then and now, it was very difficult to promote women within the system outside of the classroom. The leadership of the district was male. Virtually everything was,” Perez said. Today, likely from teachers unionizing, Perez said she thinks schools function more as a collaborative effort. Unfortunately for Perez, one of the programs she has been a big advocate for — the School Readiness and Language Development Program (SRLDP) — looks to be doomed, as Superintendent Ramon Cortines announced plans this month to cancel it entirely. However, he wants to expand the transitional kindergarten program, a spoonful of sugar that seems to have helped the medicine go down, even for Perez. Cortines announced SRLDP’s planned cancellation just a few days later. Perez did say she felt that within the district and even nationwide, the idea of universal early education appears to be taking hold like never before. As far as retiring, Perez said she “has never done it before” and isn’t sure if she knows how to. She has plenty of upcoming plans, including consulting part time for AALA, spending more time with her grandsons, traveling and writing.